If I say, "She's so granola," you know exactly what I mean -- she's a tree-hugging, free-spirited, hemp-wearing woman with long graying hair who wears her well-worn Birkenstocks to walk to the local co-op where she buys only fair-trade goods. Does that mean that a short-haired, Anthrolpologie-wearing, Cosmo-drinking girl with a 401K like me can't be "granola"? Cause I eat a lot of it. I don't buy it at the local co-op; I make my own, while wearing high heels. 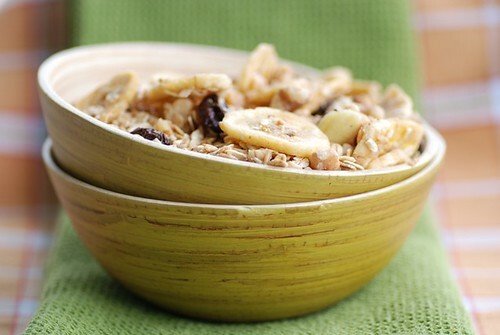 Making homemade granola is easy and allows you to control the fat, sugar, and calorie content. It's also less expensive. Don't pay $5.00/pound for pre-made granola when you can buy oats for 79 cents a pound. My current favorite is Easy Homemade Crunchy Maple Walnut Granola, a hearty maple-coated granola loaded with clusters of sticky walnuts and coconut, crisp banana chips, and tart cherries. I know it's expensive, but you have to use pure maple syrup. Recently someone said to me, "You're so Mad Men in that dress." Hah. Little do they know I'm so granola. Be sure to check out my homemade Cherry, Prune, and Almond Granola pictured above. 1. Preheat oven to 300 degrees F. Combine first 5 ingredients in a medium bowl. 2. In a small pan over medium heat, melt maple syrup and butter. Remove from heat; stir in maple extract, salt, cinnamon, and nutmeg. 3. Pour maple-butter mixture over the oat mixture and stir until well coated. Spread mixture on a large rimmed baking sheet coated with cooking spray. 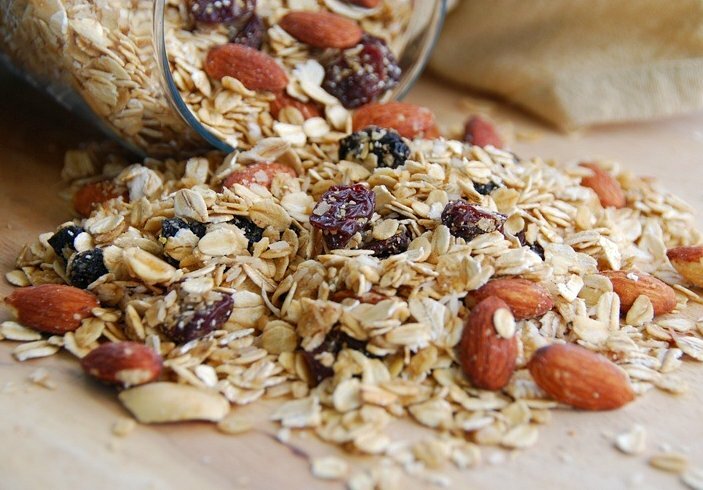 Bake for 20-25 minutes, stirring once or twice, until granola is golden brown. (If you want it extra crunchy, then turn off heat and leave in the warm oven for another 20-25 minutes.) Cool completely. Store in an airtight container at room temperature for up to 2 weeks. *Note: Maple extract is intensely flavored, so it's a great, reduced calorie way to cut down on the amount of maple syrup needed. It's available in the spice section of most major supermarkets. If you can't find it, then add an extra 1/4 cup of maple syrup to the recipe. Homemade granola is fantastic! yours look really good! I do buy granola, but now you have given me a good excuse to make it. It looks and sounds delicious. I am sure the cherries really add to the favor. I am glad you posted the recipe. I knew I needed it after seeing your photo on Twitter. Going to make this this weekend. OK, the image of you making granola in the kitchen in heels is tres elegant! Actually, we call them "crunchy." Heh. And I'd love for someone to say I'm so "Mad Men" in a dress! This looks great. I'm sure my lil' C. would love it. He's into anything crunchy and sweet, so it would be nice to feed him something other than cookies! I know exactly what you mean Susan. In Southern BC we have plenty of what I call "granola bars" but I'd be the one eating the maple flavoured granola topping my Greek yogurt. This is just what I need today some homemade granola. I live in the crunchy granola capital Eugene Oregon, we are not just granola here but crunchy! teachercooks-I prefer them to raisins. maria-Yay! Hope you enjoy it! tw-Tres elegant. I love it. abby-Oh, yeah. I think "crunchy" is more East Coast. val-In Cananda too, huh? And I had it on Greek yogurt for breakfast this morning. I really like homemade granola! I remember my mother who makes some every now and then. So delicious. That looks scrumptious! I like your description of "granola". It's funny how times change, and "granola" has now shifted/expanded to a different group of people. I too am pretty granola - but I wear makeup, high heels, and also like to include fancy indulgences such as truffle oil in my diet - along with granola! Oh I am a granola LOVAH!! Thanks for this!! I'm totally granola, and homemade at that. Lately we've been on a Cherry Coconut granola kick. Divine! I make two batches of granola a week, but I've always used oil. Butter actually sounds much better. I don't know what it is about the maple syrup but nothing gives granola quite the same light crunchiness. I've substituted everything from brown sugar to honey (because they are way cheaper) and still keep coming back to the maple syrup. I'm much more the crunchy granola type myself: Birkenstocks, and gray hair (which used to be long and flowing!). And I still make my own granola, too. 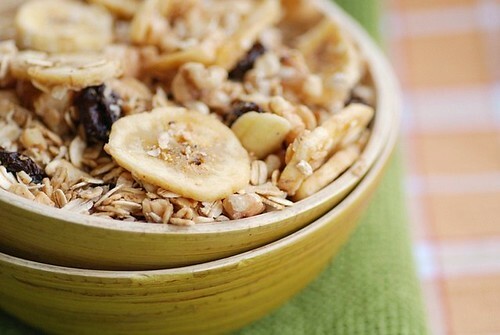 I am not granola, but I do love to eat it - we call it muesli. I am waiting for my friend to come out in May from Canada and bring me some real maple syrup - I have never eaten the real stuff before. Then I am going to try this - provided he brings me more than teaspoon full! Wonderful recipe! I made this last night and man is it a hit this morning. Now I can never go back to pre-packaged granola! Thanks! Susan - you are it - You go granola girl! Homemade granola is the best!! But the addition of maple?? YUM!! tastyeatsathome-I love it-- granola, truffle oil, and high heels. kate-Well, you know I love cherry and coconut granola too! anonymous-I prefer butter to oil primarily because of the flavor. I find the oil sometimes leaves an unpleasant aftertaste. As for pure maple syrup, there's nothing quite like it. lydia-Long and flowing? That's hard for me to imagine! rose-He'd better bring you more than that! david-Oh, I'm so happy to hear that! Thanks, David! sues-Maple syrup makes everything better. mark-That's what I had for breakfast this morning! Beautiful granola - I love the cherries in it. I'm like you, a mass of contradictions. I eat granola and occasionally tofu, had home births with midwives, homeschool, but I am not the least bit hippyish. Looove homemade granola. I've got it on my list of things to do soon!